We’re not even through the first day of 2014 and cyber attacks are back again. 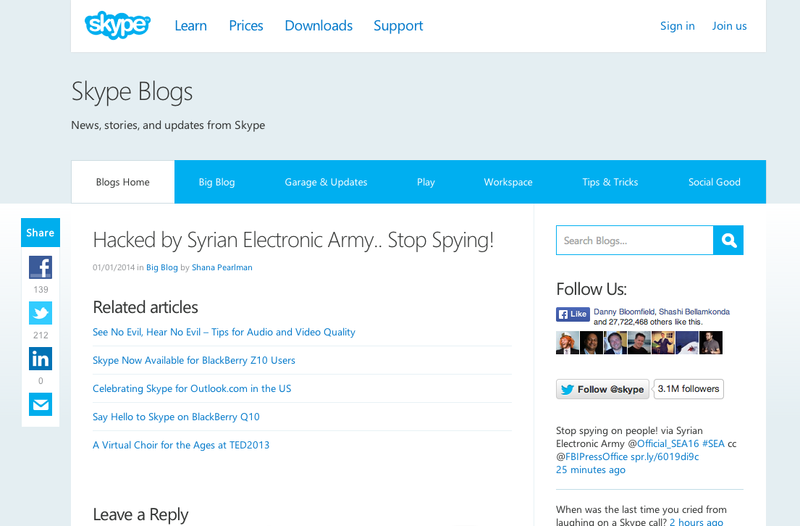 Earlier today, some person(s) breached Skype’s security and hacked its Twitter account, Facebook page, and blog. The group claiming responsibility is the Syrian Electronic Army (SEA). Its message: end spying on the public. Update: Minutes after we’ve published this post, it appears that Skype has regained control and has deleted the hacker messages from Twitter and Facebook. The SEA’s official Twitter account has also repeated the messages that were posted on Skype’s social media profiles and blog. Today’s events is most likely linked to the US National Security Agency’s revealed surveillance programs that were uncovered by former contractor Edward Snowden. Many tech companies, including Skype’s parent company, Microsoft, have taken steps to refute claims that they have been cooperating with the government. Documents from the NSA’s Prism program apparently indicate that the secretive agency could spy on Skype audio and video calls thanks to backdoor access — which was contrary to Skype’s insistence that its service could not be wiretapped. Interestingly, in October, it was reported that the messaging and calling service was under investigation in Luxembourg over its link to the NSA. A month later, the country’s data protection authority cleared both Microsoft and Skype of any violations.